Russia’s two most important bases in Syria —Hemeimeem Air Base and the Tartus Naval Port-– were hit by a dual swarming drone attack –10 drones were used to attack the air base and 3 drones were used on Tartus. 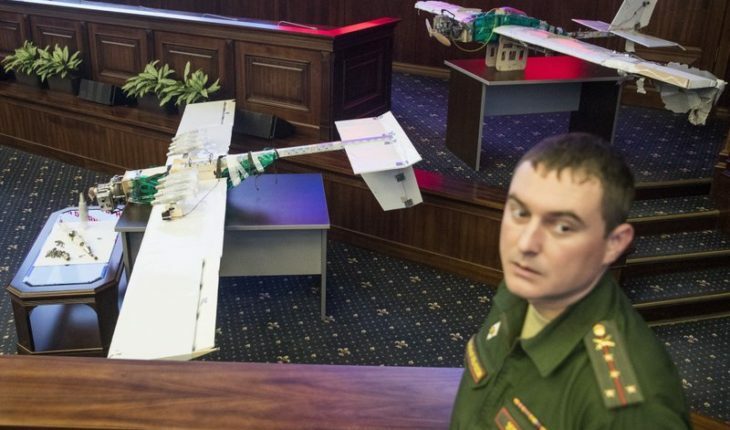 A few of the drones were recovered mostly in tact –the Russian say they were able to get control of them and land them (even though the drones are not meant to be able to land lacking any landing gear or struts). 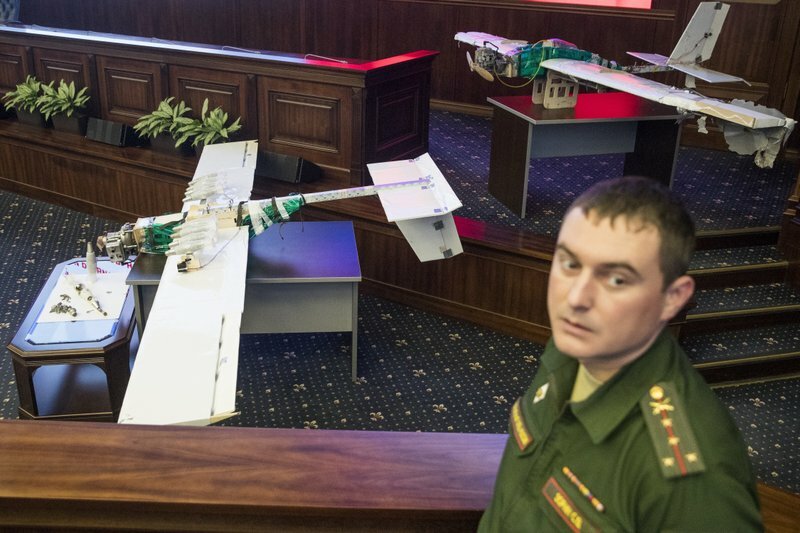 In a press conference in Moscow the drones were put on display, at least one of them with its bomblets still attached to the drone (either they survived that way or they were collected off the ground and reattached after the drones were in Moscow). The drones themselves are largely homebrew and crudely made. They mainly are wooden spars that enclose sheets or blocks of styrofoam, glued and taped into place and wrapped in plastic to improve aerodynamic quality. The bomblets themselves are stuffed with roughly 1 kg of PETN, an energetic explosive material and with small ball bearings wrapped around the explosive and glued with epoxy. Each bomblet has a mechanical fuse that explodes on impact. From the looks of the set up and the single mounting metal rail controlled by a solenoid, all the bomblets are released at one time. The drones carry between 8 and 10 bomblets each and they flew some 50 km from Idlib to the targets. Since the event, the Russians have found the warehouse where other drones are kept and destroyed it; they also bombed the perpetrators. Russia also believes the professional help came from “outside” meaning from a foreign country or foreign company. At first the Russians thought the drones were supported by the Turkish Army and they accused the Turks of complicity; next the Russians, still flailing around pointed a finger at the United States, pointing out that a U.S. Navy reconnaissance plane was operating not far away in the Mediterranean; finally the Russians started to think that the perpetrators might have been the Ukrainians working with the terrorists who carried out the mission, suggesting that the PETN may have been manufactured in Kiev. All the parties have denied any involvement. The Russians have been pushing their investigation hoping there is something about the chemical makeup of PETN from Ukraine that gives away its manufacturing origin. Whether it is possible or not to find such a fingerprint really is beside the point, since the PETN probably was obtained on the black market. There is an active black market in weapons and military supplies in Syria and it is mostly out in the open. An APP called Telegraph hosts black market offerings and transactions. Origins and customers are hard to trace. Russia is afraid not only of the consequences of swarming drone attacks in Syria, but elsewhere –most particularly if Chechen or other Russian terrorists start using them as a terror tool. As the attacks in Syria demonstrate, it is possible (if you have good intelligence) to be able to hit targets thought impossible with just a GPS map. Commercially available GPS has two limitations that make it imperfect as an accurate tool for military attacks. The second limitation is that GPS maps are good on delineating roads and street addresses, and runways at airports but they don’t show where moveable equipment is located. For that you need another form of information, as from surveillance satellites or from local spies. Indeed, what the Russians are saying is that sophisticated locational information based on intelligence was integrated with standard GPS maps to enable the drones to hit high value targets, particularly parked fighter and transport aircraft. The Russians were able to verify this was the case because the information was embedded in the stored memory of the drones that were captured. It is easy to see how a spy satellite could provide accurate overhead photographs that could easily be matched up to a GPS map. But even a survey of an airfield by humans outside the fence could be done with cheap laser rangefinders. You can buy a decent rangefinder with a 1 mile range for as little as a few hundred dollars. We probably will never know which means was used for the targeting of Hemeimeem and Tartus because the Russians bombed the warehouse and wrecked it and killed the guys who may have been responsible. It would have been much smarter had they captured the drone team and gathered the intelligence they needed. As the Russians most certainly know, the spread of easy-to-build drones and how to program them is now in the hands of terrorists. Almost anyone can glue and tape together a drone. The GPS and radios to control it are on the open market and easy to get. The drone engines were expropriated from small lawn mowers or weed whackers and there are tens of thousands of them around. Such drones are hard to detect on radar and difficult to shoot down. Every counterintelligence organization in the world is going to have its hands full trying to stop the drone terrorists before they strike. Similarly there is nothing hard about building even stronger drones that can carry larger weapons. Many years ago when I was in the Pentagon the head of Naval Intelligence approached my office and asked what we could do about small manned aircraft being sent to Syria. He was worried that such aircraft could carry as much as a 500lb bomb and strike our ships operating off the coasts of Lebanon and Syria. Luckily, we were able to be of some help because the aircraft were made in California and the company was persuaded that even though the planes were not then export controlled, we did not want them going to Syria. Things are even more difficult now. Most of the parts needed for making a drone (especially the engines and electronics) come from China, not the USA. And the PETN filled bomblets are easy to make so long as the arms black market is thriving. In the short term where we could best work with the Russians and other countries is to shut down the global arms bazaar that functions brazenly in Syria and elsewhere.